My name is Darryl Robert Schoon and on March 1, 2007, I delivered a 148 page paper on the US and global economy to the Positive Deviant Network, www.posdev.net, a group of unorthodox thinkers assembled by Marshall Thurber. The initial reaction of the Positive Deviant Network to my report was shock and disbelief. In March 2007 the stock market was still headed higher and the possibility of a severe economic crisis seemed out of the question. Many members of the Positive Deviant Network were wealthy (membership in the PDN is $5,000 a year) and the majority did not take kindly to my then apparently far fetched conclusions. In the 1990s, when I began my research on the Great Depression I didn’t understand financial complexities. I didn’t understand why economic forces were about to bring down the US and world economies. Now, I do. At the time, I never expected to write a book on the economy. My interest was personal, driven by a desire to understand issues and complexities that affected our world that I didn’t understand. My membership in The Positive Deviant Network changed all that. The Positive Deviant Network (the PDN) had been assembled by Marshall Thurber, my friend from law school. Marshall had gone on to become a leading innovator and teacher. He was a friend of Buckminster Fuller and an associate of Edwards Deming, the “father of quality” who transformed Japan into an industrial power. Among Marshall’s early students were Robert Kiyosaki, author of Rich Dad, Poor Dad and Tony Robbins. Marshall believes radical innovations and solutions are rarely found by mainstream thinkers, that such ideas and solutions appear first on the edges of society among “positive-deviants”. In October 2005, Marshall convened The Positive Deviant Network, his experiment to bring positive-deviants together in a collaborative setting. Another member of the Positive Deviant Network, John Botti, also had deep concerns about the US economy. Former head of a successful multi-billion dollar hedge fund in London, Credit Magazine had named John to its Hall of Fame Top 50 bond traders and I knew my analysis had to be worthy of John’s attention. My thoughts ultimately took the form of a 148 page white paper analyzing the coming economic crisis which I presented to the Positive Deviant Network on March 1, 2007. The reception to my report was controversial. Many in the group objected to my conclusions and my predictions of a severe economic crisis. In May 2007, How To Survive The Crisis And Prosper In The Process was made available at www.survivethecrisis.com and I began writing articles on economic issues. The interest in the book and my writings has been gratifying. 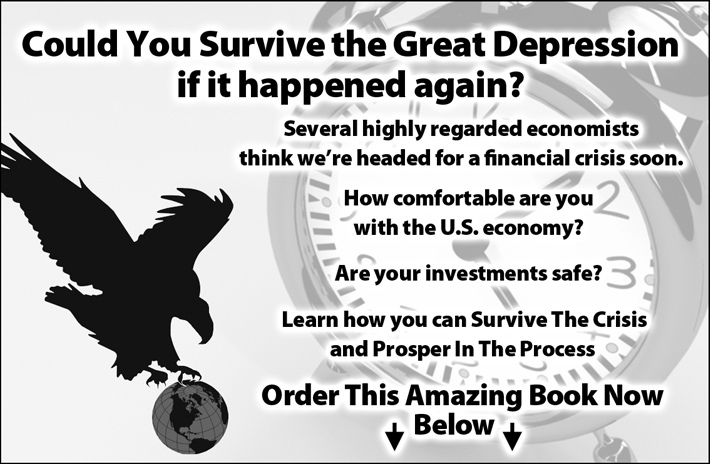 How To Survive The Crisis And Prosper In The Process was available as a pdf download for $79.99, and a bound copy for $99.99. The book was ordered by readers in over 25 countries. During its first two months, www.survivethecrisis.com was accessed by over 10,000 viewers from 93 countries. Most viewers (from financial websites publishing my articles) have post-graduate educations and earnings in excess of $100,000 a year. Clearly, we had struck a chord. The Wall Street Journal and USA Today linked to articles I had written and my articles are now posted by some of the world’s foremost financial gold sites. I was also honored by the invitation of Professor Antal Fekete to speak at his Gold Standard University Live session in Hungary in 2007. Since then I have given talks in the US, Europe and Australia on the unfolding economic crisis and because of the accelerating nature of the crisis in the spring of 2009 I started providing daily news updates and a monthly commentary on a subscription basis at Moving Through The Maelstrom With Darryl Robert Schoon at www.drschoon.com. When I delivered my paper on March 1, 2007, an economic crisis appeared improbable. The idea that billion dollar Wall Street hedge funds would suddenly collapse, that depositors would line up outside a bank in England to withdraw funds, or that the world’s central banks would be forced to provide trillions in credit to reassure markets “all is well” seemed a paranoid and far-fetched imagining. But all the above has happened and today markets are still trying to find a footing on slopes that once appeared safe and unobstructed. Banks are no longer sure of the safety of their assets or of the ability of their debtors, corporate and otherwise, to repay debts and the crisis, once believed contained, is proving itself to be a far greater threat than previously believed. Most people still do not realize the danger they are in. I wrote this in-depth analysis to enlighten others so they understand what is happening and can survive what will be the most dangerous economic event in our lifetime. It is not too late to do so. It will not always be so. Marshall Thurber tested members of the Positive Deviant Network for predictive accuracy and certainty. In a test developed by Columbia Professor Dr. Phillip Tetlock, author of Expert Political Judgment, Darryl Robert Schoon achieved zero deviation, the highest score possible. 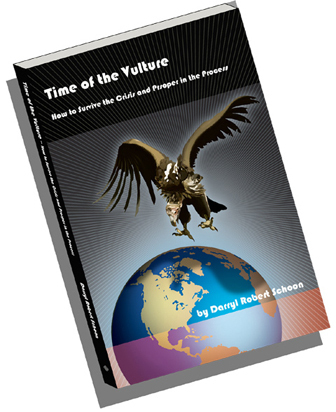 How To Survive The Crisis and Profit In The Process will give you the tools and understandings you need to survive and prosper during the coming rearrangement of global wealth and power. The crisis I predicted in 2007 happened. But the worst is still ahead. Today, deflationary undercurrents are gathering momentum and safeguards erected by central bankers are being swept away by forces now too strong to contain. We are in the second stage of a historic collapse where economic dislocations will bring even greater devastation than in the 1930s. Events are moving quickly and because of this, I have added updates to previous editions of my original analysis. Waiting for the crisis to develop will be fatal. If you are to survive and prosper, you must first understand what is happening and act now. Gold is now in stage three, the last stage where prices have not yet exploded towards their final highs. You will find the book to be a revelation, you will learn of events and facts you are not aware of, events and facts of great importance that will soon affect your life. These are perilous times and few are aware of the danger they are in. You owe it to yourself and your loved ones to see if this is so. This dynamic source of Darryl Robert Schoon's views on fast moving current events is updated daily so you will be fully informed about the ongoing crisis.